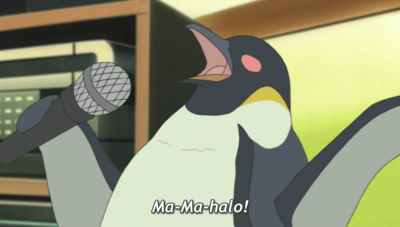 A Brief History of Anime Penguins – PART TWO!! 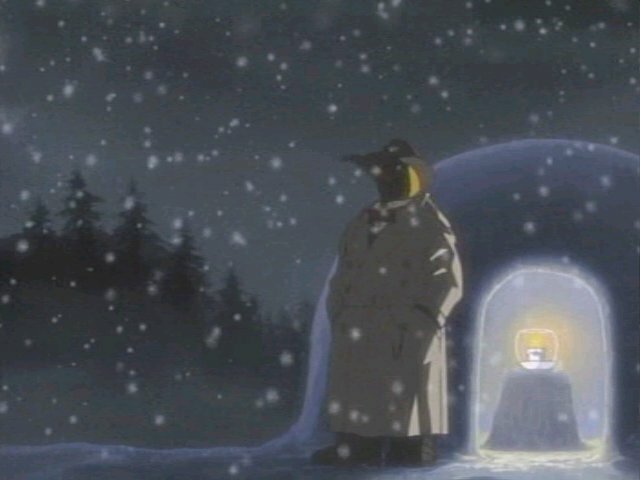 In the light of Polar Bear’s Cafe and it’s high Penguin content, it’s time to look back once again at the penguins through the history of anime. This Sanrio creation possibly answers my question about penguins wearing bowties from the first Penguin History post. 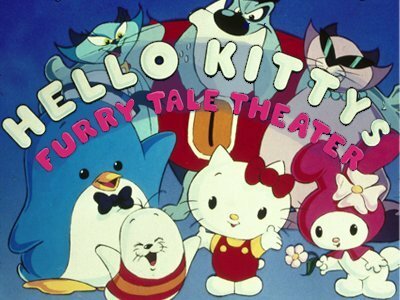 Created in 1979, he appeared in Hello Kitty’s Furry Tale Theater in 1987. I don’t know of any other appearances. 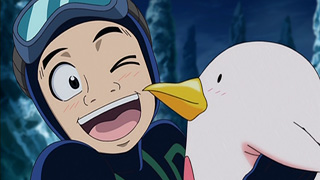 The 1998 revival of Fujio Akatsuka’s iconic magical girl character featured a cool and cheeky surfing penguin called Ippei. No word on if he died on the way back to his home planet. The great detective Usami-chan has a detective contest with the penguin transfer student Pensuke-kun to determine who stole the teacher’s giant set square and Nyami-chan’s socks. This anime based on the Level 5 football-themed roleplaying game of the same name features many, many crazy special moves. One of which is Emperor Penguin No.2. Which involves kicking a ball while accompanied by five penguins that emerge from the pitch and perform a short Itano Circus with the ball. Inazuma Eleven is kind of nuts. 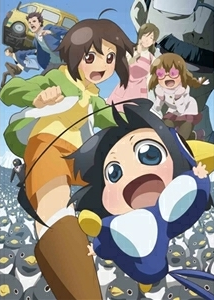 A girl with a hatred of penguins is given a superdeformed robot penguin-girl by her penguin researcher father in the hope of making her see how cute penguins are. Madcap hijinks ensue. A girl is raised from the dead by a magic penguin hat. She and her brothers are given three penguins, and when possessed by the hat she orders the brothers to recover the “penguin drum” with the penguins’ help. And that is barely scratching the surface of this fantastic show. In the world of Toriko there are endangered penguins called Wall Penguins. While a full grown Wall Penguin is dangerous, their babies are naive, fearless and delicious. Yun is a baby Wall Penguin adopted by Komatsu. Its saliva proved a vital ingredient in part of Toriko’s Full Course Menu, the Century Soup. Based on Aloha Higa’s manga, Polar Bear’s Cafe features a cafe run by a Polar Bear. One of his main customers is a penguin, called Penguin. Apparently some sort of office worker, though he is vague when asked directly what he does for a job, he pines after a female penguin called Penko who works at a bakery. 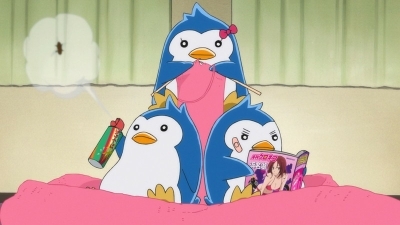 That ends this installment of A Brief History of Anime Penguins, are there any more I should include next time?